This recap was written by the brilliant Terri! Enjoy your new Sidekick status! In this world, there are one million souls, and each time they die, the same souls are reincarnated. Because they’ve lived for thousands of years, these souls have made remarkable advancements in science, technology, architecture, etc. The souls are reincarnated by their deity Janan, who may or may not dwell in the Temple in the city of Heart, which has no doors and is supposedly empty. Many of the souls have stopped believing in Janan since he never protected them during the hard times in their past lives. 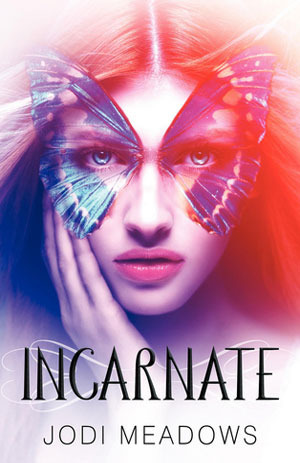 The same million souls have died and come back over and over – until a soul named Ciana dies and doesn’t come back – and Ana is born in her place. Ana is new and she wants to know why. Mistreated and disdained by her mother, Ana sets off on her own for the city of Heart, where she hopes to find out more about why she was born and what she’s supposed to do with her life. Ana’s mother Li hates her existence, constantly belittles her and calls her a “nosoul,” a mistake and an usurper who took away everyone’s friend Ciana. Ana is 18 and has grown up unwanted and uneducated: Li hasn’t taught her much of anything. She taught herself to read and she loves the music of the composer Dossam, which brought her comfort in her horrible childhood. Ana leaves for the city of Heart. Not far into her journey, she is attacked by sylph and rescued by an eighteen-year-old boy named Sam. Ana injures her hands protecting Sam from being killed by sylph, even though he would’ve been reincarnated, because she likes him. Ana moves into Sam’s house, where she sees musical instruments everywhere and realizes he’s Dossam. She is embarrassed but he doesn’t care, and begins teaching her how to play the piano. The Council agrees to let Ana stay in Heart, use the libraries and electronic records, and learn skills like sewing, baking, music, history, etc so that she won’t be so helpless. They keep her on a tight schedule and she has to report on what she’s learned every week. Ana finds that many citizens in Heart are afraid of her, or openly hostile. They’re afraid of what a newsoul means. Ana attends a party where two souls are celebrating their relationship. Everyone is in costume and the two lovers must find one another and complete a symbolic journey. Ana dresses as a butterfly, symbolic of her own fleeting existence in the eyes of souls who have lived for thousands of years. She dances with Sam and they kiss. After the festival, Sam and Ana are attacked and Sam is injured. Sam is arrested and accused of trying to murder Ana. Ana is placed in the custody of Li, who has come to Heart. With Sam and his friends in jail, Ana is forced to stay with Li. Li forces her into a new schedule, with lots of running and agricultural study. Li burns the song Sam wrote for Ana, and tired of the poor treatment, Ana runs away. Ana finds her friends in jail, but before she can try to rescue them, dragons attack again. Ana sees a door and runs though it, only to realize she’s in the Temple. Ana walks through the Temple and takes some books. She feels the Temple gasp and a voice tells her she is a newsoul, a mistake of no consequence. She believe it is Janan. Ana encounters Meuric in the Temple, and he tries to trap her inside. When he tires to throw her in a pit, she stabs him in the eye, possibly killing him. Ana escapes back into the city and finding the prison empty, she goes back to Li’s house. Ana asks Li what she’s done with Sam, but before she can answer, her absentee father Menehem kills Li. Menehem reveals that he had been experimenting with a way to stop the reincarnation of souls, and Ana replacing Ciana was proof of his success. He then explains that he has poisoned Janan and anyone who dies that night won’t be reincarnated; newsouls will take their place, and natural selection will ensure that the weak die while the strong survive. Meneham was angry about Meuric and everyone who believes in Janan, and he wanted to prove whether or not Janan was real and all-powerful. He has proven that Janan is real, and also that he can be stopped. Ana runs out to find Sam and make sure he doesn’t die while reincarnation is suspended. 72 people die while Janan’s powers are suspended.